Next week's downloadable content has been a long time coming, but Stevie Ray Vaughn's classic 1983 blues album Texas Flood is finally coming to Rock Band and Rock Band 2. 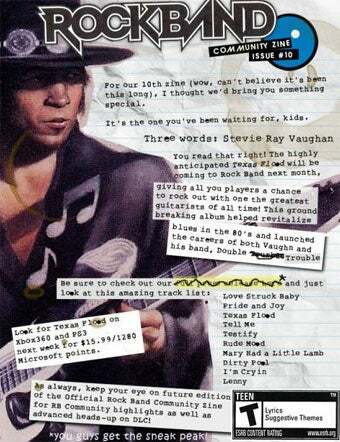 Harmonix revealed the full album's availability via the Rock Band Music Store to subscribers of the Rock Band Community Zine, with ten tracks from Stevie Ray Vaughn and Double Trouble landing (presumably) starting next Tuesday, March 3rd. Announced last summer, Texas Flood is the second to last from that batch to hit—Jane's Addiction's Nothing's Shocking still remains unreleased. Price is $15.99 for the PlayStation 3 version or 1280 Microsoft Points for the Xbox 360 and contains the following tracks that you're probably going to have a hard time playing very well.